A beautiful garden – yes, but one with a purpose. Long House Plants has been producing home grown plants for more than 10 years – here is a chance to see where it all begins! 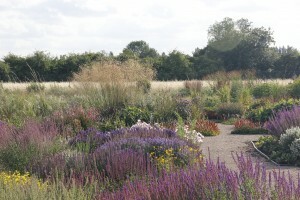 A nursery stock plant area can be just blocks of plants to propagate from, but here it has been thoughtfully designed so that the collections of plants look good together, showing the differences between varieties, linking shapes, textures and colours across the planting schemes with plenty of seats, carefully placed to enjoy the plants. 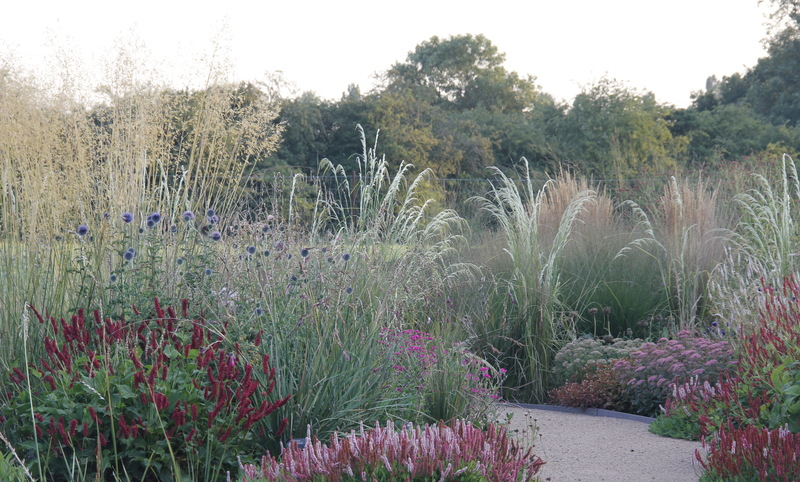 Entered through the plant sales area a wide path lead you between a large stock bed of Hemerocallis and a large bed of Arundo donax, Iris sibirica, Miscanthus, Filipendula, Rodgersia, Eupatorium. The journey continues through recent planting of a small collection of bamboos leading to collections of dwarf Syringa, Phlox, Galega, Symphotrichum, Hesperanthera, more Miscanthus, Actaea, bordered by Camellia sasanqua. Passing through a short avenue of Luma apiculata and collections of Camellia and Pittosporum, the space opens up with views over farmland. The wide, gently curving paths lead you through the collections of Cornus, underplanted with varieties of Vinca minor, Bergenia and Epimedium. A large grass collection including Deschampsia, Pennisetum, Briza, Molinia, Stipa, Schizachryium and Anemanthele planted with Cirsium, Sanguisorba, Trifolium, Veronicastrum, Aster amellus and A. x frikartii, Helenium, Sedum, Centaurea and Dierama. You will see stunning combinations of Salvia nemerosa and S. x sylvestris, Anthemis, Geranium sanguineum varieties, Erigeron glaucus in a gravel garden for early Summer colour with Coreopsis, Osteospermum Geranium x riverlianum, Oenothera for late Summer colour with a back ground planting of Persicaria amplexicaulis varieties that start flowering in June and go on into Autumn. There is a large bed of Agapanthus, Crocosmia and Kniphofia divided by a cambered cobbled path which is at peak display in August. The Autumn border houses the collection of hardy chrysanthemums, Symphotrichum novae-angliae, Helianthus, Rudbeckia planted with Miscanthus and Panicum grasses. Plants are labelled or records of planting positions kept to ensure accurate propagation. Tim uses the garden to help customers with designing their own borders, he can demonstrate his ideas and show what grows well in the local London clay. Some borders are newly planted and there are areas still to be developed – roses are being grown for a perfumed garden and work has started on a woodland garden. Most importantly, there will be tea and cake! 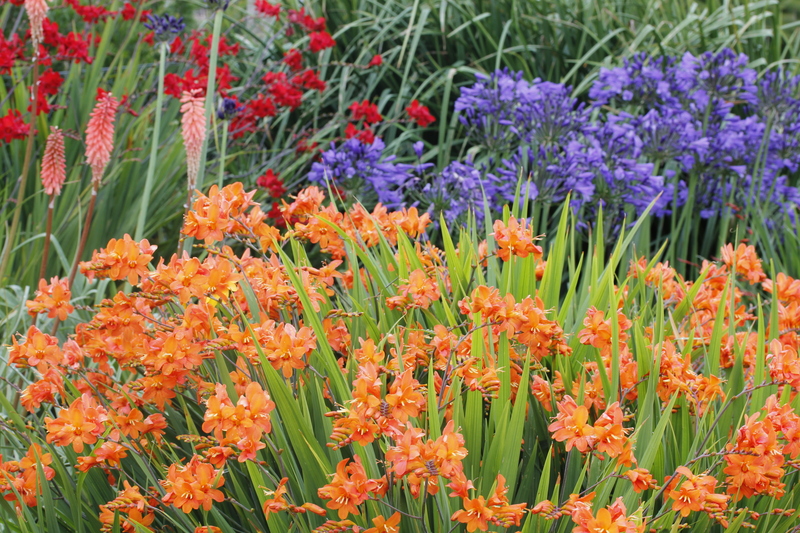 Wednesdays are for the National Garden Scheme, where the entrance fee of £5 for adults, £3 for children and proceeds from the refreshments will all be donated to their chosen charities. The refreshments for the weekends will be provided by the Salvation Army, local garden clubs/charities who will keep all the proceeds. This is very new for us, we want to get things right, so feedback will be welcome.